ADVANCED TICKETS ARE NOW CLOSED. SOME TICKETS WILL BE AVAILABLE ON THE DOOR. 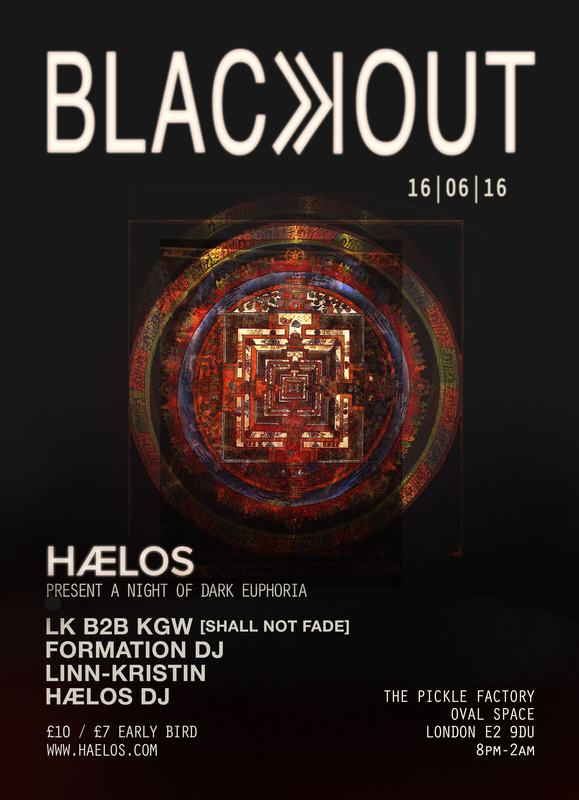 London based HÆLOS bring you BLACKOUT: a night of Dark Euphoria, vinyl and the freshest electronic music. "We wanted to put on a night that shows off the cutting edge of vinyl based electronic music, whilst serving up a healthy dose of party. We're partnering with new house and techno record labels/producers who we admire and will be joined by some friends for an evening of live DJ sets." The inaugural event will take place at The Pickle Factory and promises an intimate night, showcasing HÆLOS' favourite dance music. The first lineup is headed up by Bristol label SHALL NOT FADE RECORDS, with LK and its founder KGW playing back to back. "We came across LK's 'Keion' release on SNF and his track 'Lesa Known' kind of blew us away. Also releasing tracks as VIERS, under his LK moniker you can expect more minimal production with a dusty aesthetic. There are nods towards jazz and Detroit-orientated drums propel you along in calmly-collected euphoria. We're pumped to have LK and Kieran go B2B and are looking forward to watching the room go off."